what happens when your marriage to a stranger does not work out? We all know a couple who claim to have fallen in love at first sight, but the latest trend is to marry at first sight. It's great for the fairytale believers, but what happens when it doesn't have a happy ending? Hollywood's latest fad is the 'married at first sight' trend. Reality shows portray the lives of people who have been too picky to find true love, marrying a perfect stranger in the hopes of a happily ever after. How does that translate into Australia though? Is it legal to marry a stranger? Are arranged marriages allowed by Australian law, or how long are you supposed to know someone before you can commit to "ever after"? Most importantly, how complex will it be to get a divorce if the marriage was not made in the stars? Let's take a look. Firstly, arranged marriages are legal in Australia, while forced marriages are illegal. A third party may arrange a marriage, but only with the full and free consent of the couple. If someone forces a couple to be married, they may face imprisonment. While the law does not require that the couple know each other well or prove that they have had a relationship before they are to wed, it is against the law to pretend to be someone else. This fraudulent act could lead to an annulment. Unlike wedding vows, the law does not require that spouses love one another, be faithful or live together. However, couples must provide written notice of their intention to wed. They must complete a Notice of Intended Marriage form 30 days before the wedding date, and hand it in to an authorised celebrant. The form must then be forwarded to the Registrar of Births, Deaths and Marriages after the ceremony. Thinking back to Elvis' lyrics "..wise men say, only fools rush in.." and he wasn't even talking about the legal repercussions of rushing into marriage. 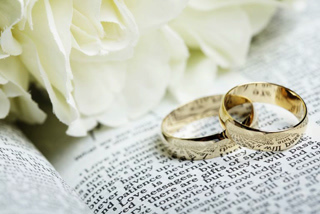 If you wish to marry quickly, you can do so legally, provided you are aware of any potential risks. Australians may only obtain a divorce once they have been separated for 12 months. In most cases, couples who have been married for less than two years will have to undergo marriage counselling before the court will grant a divorce. Finally, couples would do well to consider the costs involved in filing for divorce. If you have many assets, you may end up lose some of it in property settlements in the divorce. What should you take when you separate?